Home > News > News > Oliver Returns! Our resident scene-stealer, Oliver Zimmerman, will be back to delight kids of all ages in The 2013 Christmas Show: The First Noel. 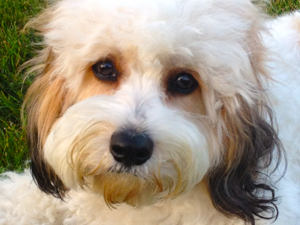 For those who saw Oliver in the role of “Sandy” in Broadway: Now & Forever, you know how he can turn on the charm with his doggone cuteness factor! Being the professional that he is, Oliver is hard at work in rehearsal, taking direction and learning his “track” to make sure he gives a great performance. You can check out Oliver’s bio, along with those of his two-legged cast mates, by clicking here. Oliver hopes you’ll come see him in this year’s all-new Christmas Show. Don’t have your tickets yet? Click here to purchase. 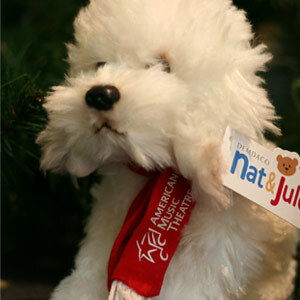 New to our Gift Shop this year will be adorable Oliver-inspired stuffed animal puppies complete with an AMT scarf. This one won’t fetch the morning newspaper, but just like Oliver, it’s super cuddly and strikes a lovable pose.